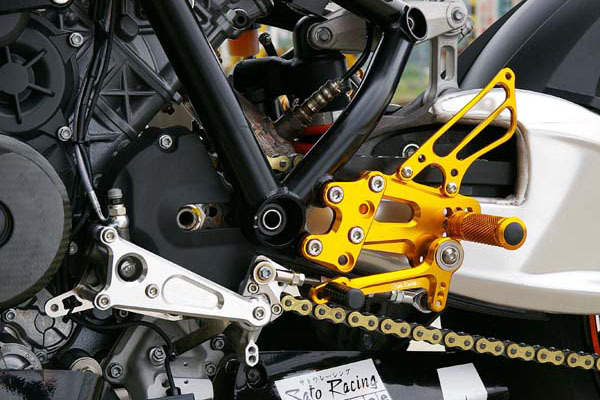 SATO RACING Rear Sets (standard version) for KTM RC8 and RC8R are made from high grade billet aluminum anodized in your choice of Black, Silver, or Gold finish. Modular design lets you choose from 18 adjustable positions, ranging from lower-than-stock positions to more agressive positions that bring your feet higher up and further back compared to stock. 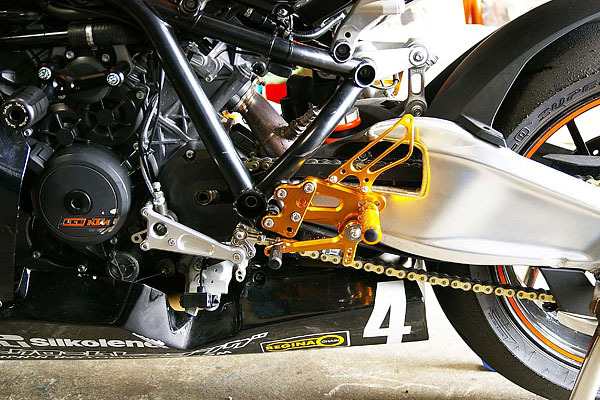 If you prefer a reverse shifting pattern, there's an optional Reverse Shift Plate that does the trick. 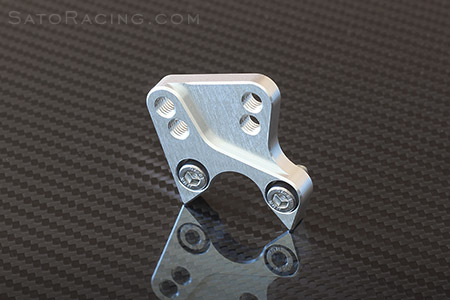 We also have a Shift Spindle Holder that works great with the Rear Sets to provide an even sturdier, more sure-footed shift feel. (Recommended with the Reverse Shift Plate). 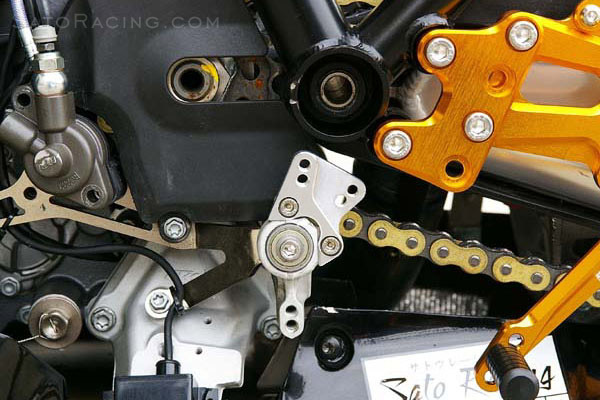 IMPORTANT NOTE: The silver lower fairing support bracket seen in these photos had been on this RC8 race bike prior to installation of our Rear Sets, and is not a part of this Rear Sets kit. 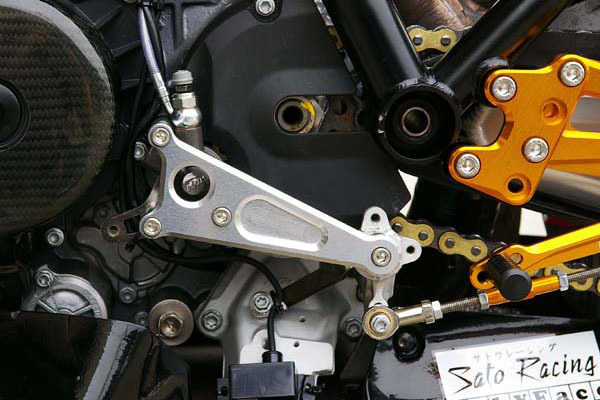 (It is possibly an older KTM Powerparts item, but we are not certain). 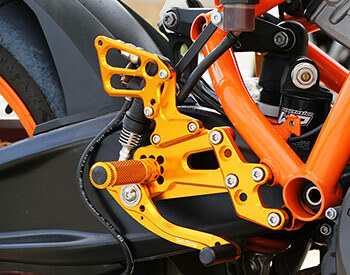 A fairing support bracket is NOT included with these Rear Sets. 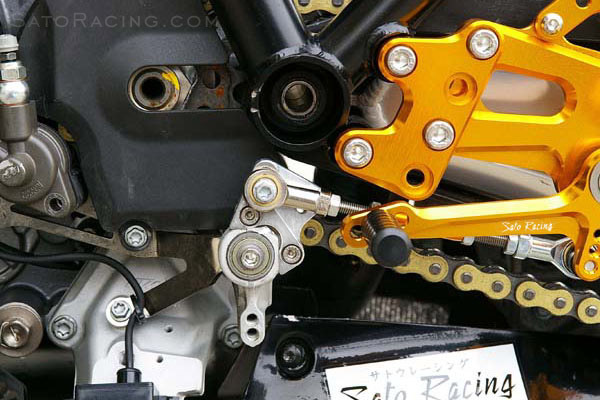 the Racing Version has different base plates that give you a higher overall range of positions. 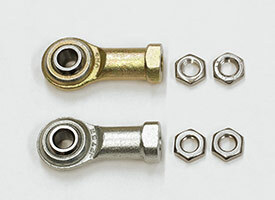 If you have a 2011 and later RC8 R that uses M8-size male rod ends for the stock shift rod, this kit provides the following M6-size Female Rod Ends and Jam Nuts you will need to use the shift rod included with our RC8 Rear Sets. a reverse shift pattern. 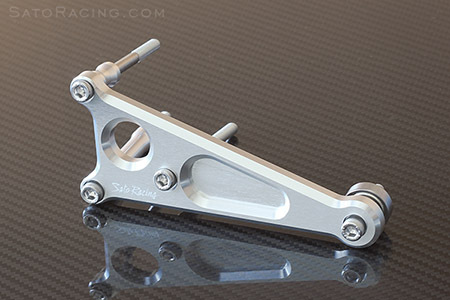 Anodized billlet aluminum with stainless steel bolts. along with the Reverse Shift Plate. 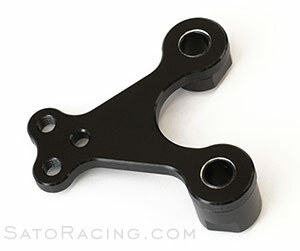 This Shift Spindle Holder adds strength and rigidity to the RC8's shift rod linkage for smoother operation. 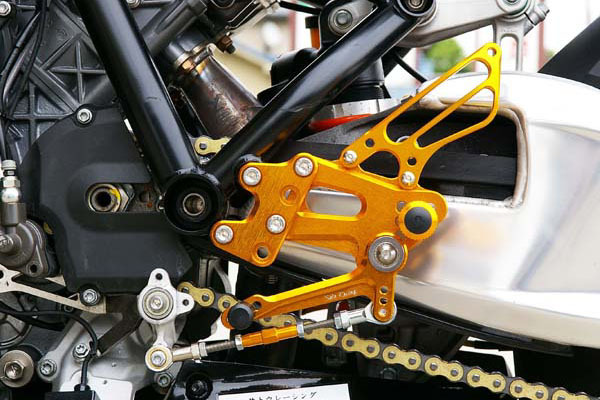 Includes internal bearings ideal for holding the shift shaft steady during heavy-duty use. 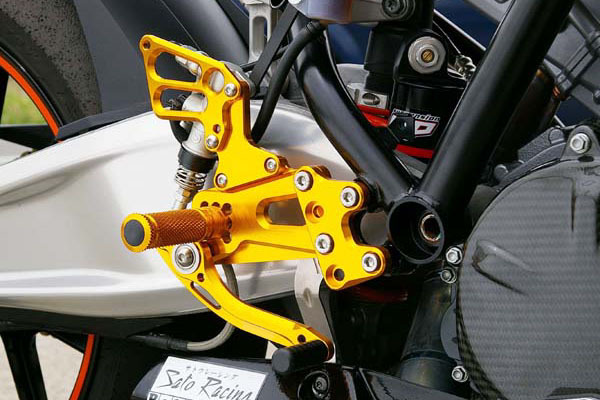 Recommended if using our Reverse Shift Plate. 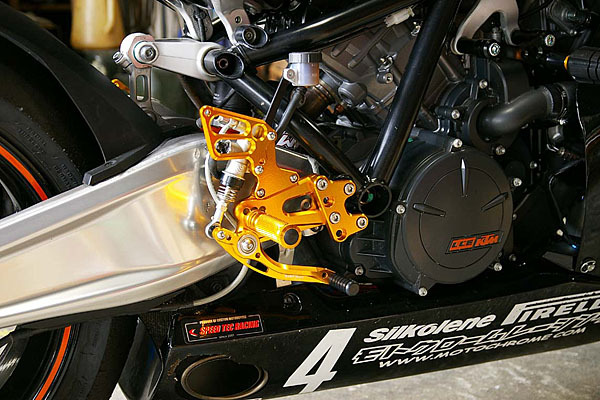 Anodized billet aluminum bracket and collars, with stainless steel bolts. 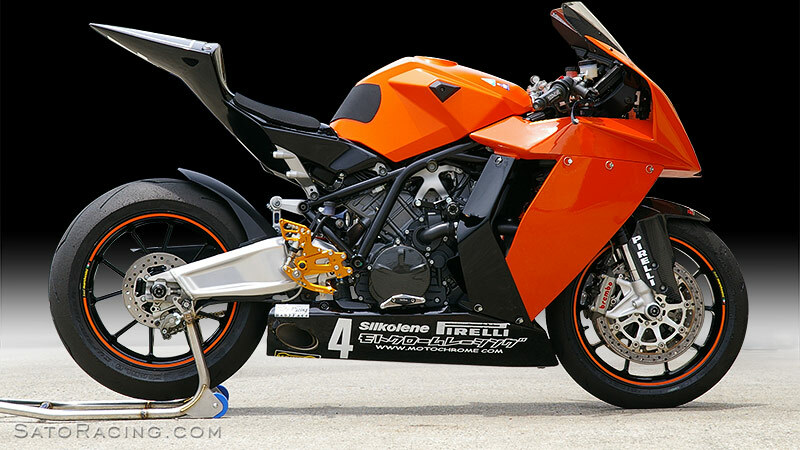 This black-anodized billet aluminum Fairing Stay is needed if installing Sato RC8 Rear Sets on an early RC8 with an Akrapovic full exhaust system. 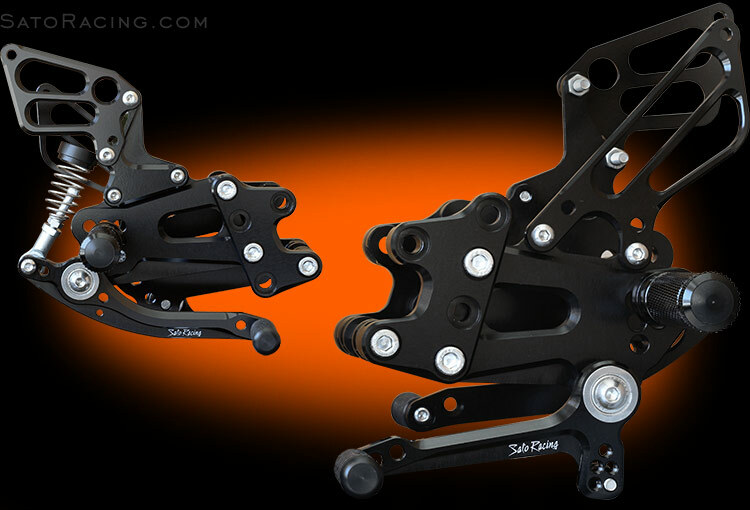 Replaces the base plate collars (10, 11) on the brake side (see Rear Sets Parts List for details).